Boys all have heroic dreams in their minds. They are hungered for adventures. But the rapid development of the society has brought some potential risks to children's growth. The crowded traffic situations make parents worry about boys' trips in cities. Moben Intl Co., Limited has launched a new kind of intelligent vehicle, Fosjoas maple self-balancing electric unicycle K1 in the end of September, 2015. They have continued the high quality of former Fosjoas models. Fosjoas K1 can make boys' dreams of adventures come true. At first Moben designers wanted to create a new intelligent vehicle, which is so different from traditional ones. One of the designers is a die-hard fan of skateboarding. Skateboarding is widely regarded as the origin of modern extreme sports. So they decided to manufacture motorized skateboards. They did it. 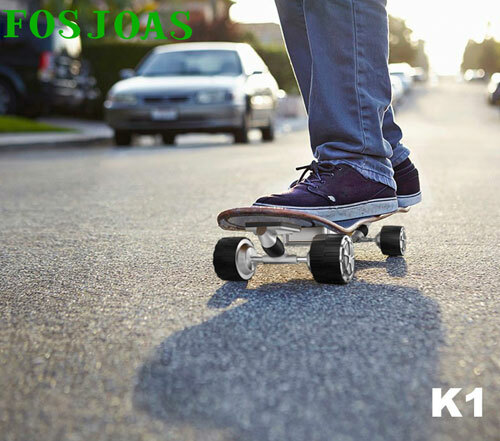 Fosjoas electric skateboards K1, as the first skateboard model of Moben, appear in the market. And they have been well received by boys since that. Fosjoas complete skateboards K1 electric unicycle self balancing scooter are driven by the green resource, electricity. They have adopted the original Sony lithium batteries, which are safer, greener, and more non-toxic than ordinary batteries. The battery capacity is up to 163 KWh. Each Fosjoas K1 is equipped with a wireless remote control. The effective distance of M3's wireless remote control is 10m. With the help of it, users can easily control the speed and directions of the scooters. What's more, Fosjoas K1 has double circuits and double main control chips. If there is a failure in one of them, the other one will ensure the safety of sliding as soon as possible. As a result, users can have safe and long-distance trips with Fosjoas maple electric skateboards K1. Fosjoas K1 skateboard help boys surf on the land in cities freely. They can slide through the streets and look for the new things they haven't noticed before. With the help of K1, boys will fully enjoy the adventure tours in cities.